However, he refused to reinstate a tax on the wealthy, saying “this would weaken us, we need to create jobs”. The minimum wage will be increased by 7% – and the cost of this increase will be met by the government rather than employers. “We are in the process of fine-tuning and to see how to finance it,” he added. They wanted more than just a politician’s promises. They wanted measures, banknotes in their pockets, a tangible change in their impoverished daily lives. So here – at the core of the address – were four simple changes: a rise in the minimum wage; the removal of tax and social charges on overtime; encouragement to employers to give workers a tax-free bonus; and an end to a surcharge on most pensions. Plus a note of contrition, and a promise of a new “national contract” built on electoral change and wider consultation with the provinces. Chuck in the concessions already given – an end to the fuel tax rise and “mobility” grants for people who drive to work – and the yellow vests suddenly appear as one of the most successful protest movements of modern times. “I assume my share of the situation – I may have given you the feeling I have other concerns and priorities. I know some of you have been hurt by my words,” he added. 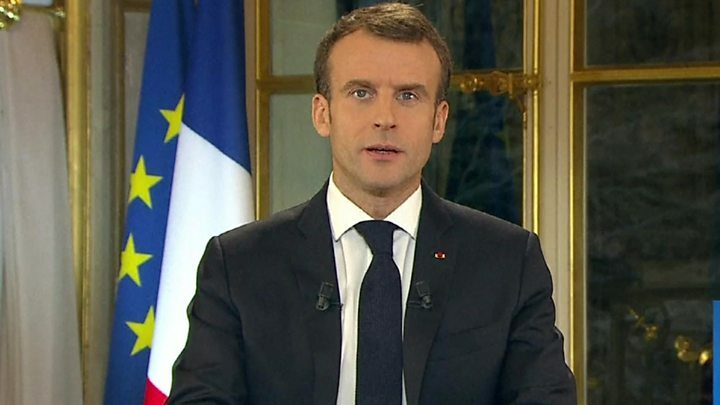 He sought to change this impression on Monday, pledging to meet mayors from all the regions of France, and encourage “unprecedented debate”. “We must tackle the question of immigration,” he added, while also urging the nation to come together to “change in order to take into account climate change and other challenges”. His political opponents were also critical: left-wing leader Jean-Luc Melenchon said he expected more protests, right-wing politician Eric Woerth described the moves as a “short-term” solution, and far-right leader Marine Le Pen said Mr Macron had addressed some but not all of his mistakes. Meanwhile, a group of anti-racism NGOs, SOS Racisme, told Le Figaro newspaper they were concerned about Mr Macron’s comments on immigration.